New York Times, the famous new paper published in New York and distributed internationally has a nice feature on their web site. 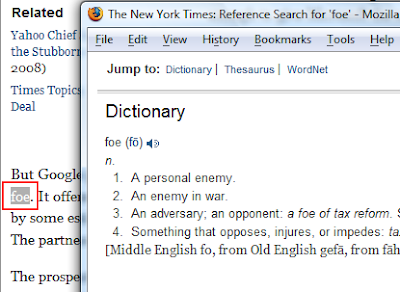 Readers of the articles on the NYT web site can double click on a word to lookup for word definition. To try this option, open the New York Times news article and double click on any of the words; you will see a popup window with definition of the double click word. Thanks for the link back buddy!